Box Text: Aggressive Inline - skate the edge of sanity. FEATURING TODAY'S TOP SKATERS: Skate as Jaren Grob, Taig Khris, Eito Yasutoko, Franky Morales, Matt Lindenmuth, Shane Yost, Sven Boekhurst, Sam Fogarty, Matt Salerno or Chris Edwards. INCREDIBLE SOUNDTRACK FROM BANDS SUCH AS: Hoobastamk, Black Sheep, Pharcyde, Reel Big Fish, Sublime and more! - More grinds, manuals and big air tricks than any other game! - 9 huge environments with level altering cinematics. - Punish your friends with split screen multiplayer and build the ultimate skate park. 03-03-2018 insettasport Box Text Aggressive Inline - skate the edge of sanity. FEATURING TODAY'S TOP SKATERS: Skate as Jaren Grob, Taig Khris, Eito Yasutoko, Franky Morales, Matt Lindenmuth, Shane Yost, Sven Boekhurst, Sam Fogarty, Matt Salerno or Chris Edwards. INCREDIBLE SOUNDTRACK FROM BANDS SUCH AS: Hoobastamk, Black Sheep, Pharcyde, Reel Big Fish, Sublime and more! 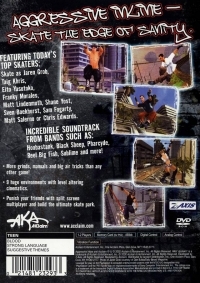 - More grinds, manuals and big air tricks than any other game! - 9 huge environments with level altering cinematics. - Punish your friends with split screen multiplayer and build the ultimate skate park. 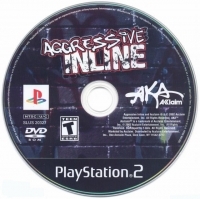 This is a list of VGCollect users who have Aggressive Inline in their Collection. This is a list of VGCollect users who have Aggressive Inline in their Sell List. This is a list of VGCollect users who have Aggressive Inline in their Wish List.